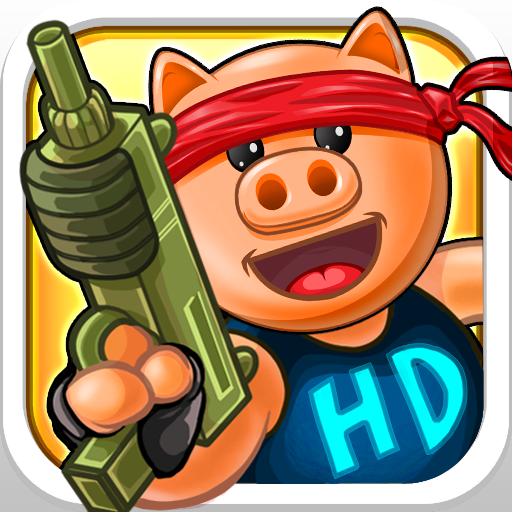 Hambo HD ($2.99) by Miniclip.com is a physics-based game where, instead of flicking dogs or launching birds, players have to shoot pigs from different angles to blow them away. Honey, grab your Uzi because we’re making bacon tonight. 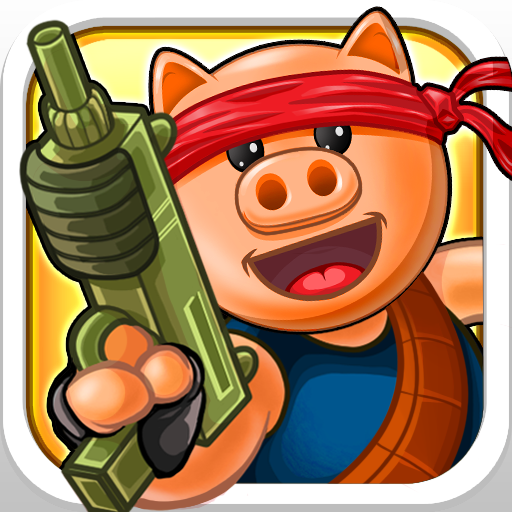 Players control Hambo, a handkerchief wearing, gun toting pig that has revenge on his mind and an arsenal of firepower at his side. 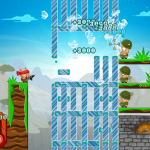 Hambo doesn’t move, but his guns can shoot through blocks of ice, ricochet off metal walls and turn enemy pigs into canned Spam and pork ribs. 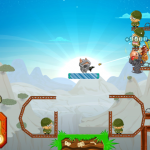 The graphics of this game are cartoon cute, so it’s a good thing that the designers chose to have the pigs explode into various pork products instead of a bloody heap of meat. It keeps things clean and PG-rated. When Hambo points his weapon at the enemies, they make a terrified face before being taken down. Don’t feel band though. These swine deserve their punishment. 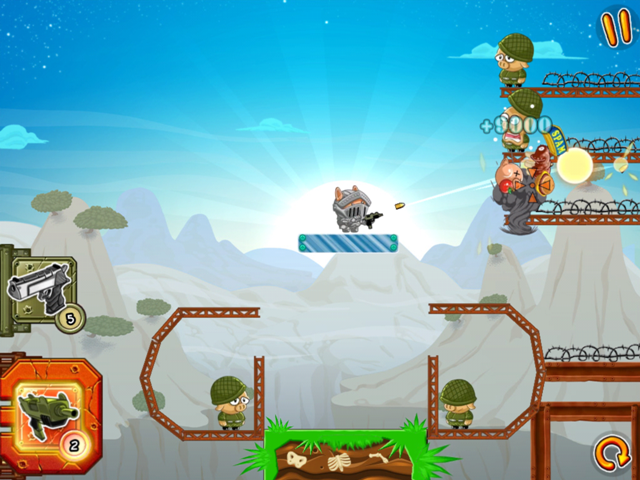 There are 200 levels across five different missions. 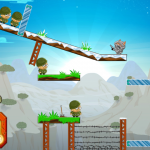 Players earn new weapons as levels are unlocked, but new obstacles also get unlocked. 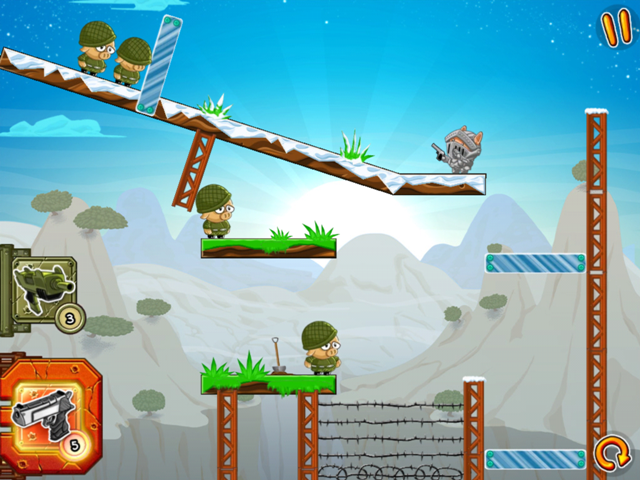 Pigs will bounce from springy platforms or slide into Hambo, knocking him off the cliff, or fall into well-protected crevasses, making it impossible to kill them. 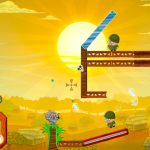 The puzzles on the first 40 levels are fairly simple. Players will breeze through them in a couple of hours. 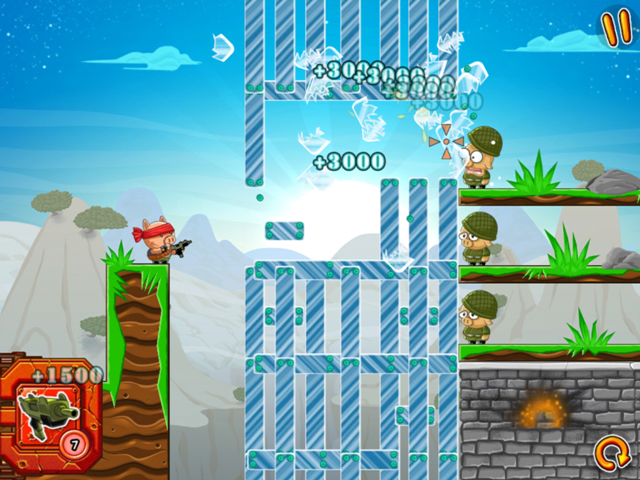 Once the second mission is unlocked, things get a little more complicated. Unfortunately, the monotony of having to play 40 easy levels before getting to a new mission is a bit much. 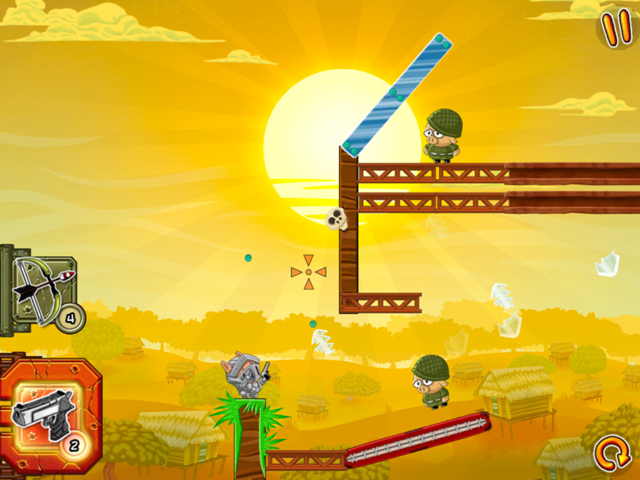 Players earn coins for completing puzzles. 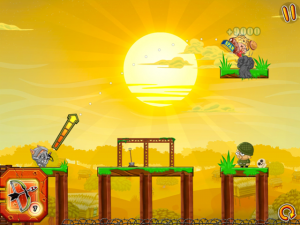 The coins can be used to outfit Hambo in different costumes. One outfit costs 500 coins and if you achieve gold medals on all 40 levels of the first mission, you will just about reach that goal. Players who want to unlock new outfits without having to work for it can buy additional coins through in-app purchases. This game is a lot of fun. There are plenty of levels. The graphics are fun and clever. Players will have fun flipping through the many costumes that Hambo can wear. The price is a bit steep for a casual game at $2.99, but there is an iPhone/iPod version for only $0.99. The only problem I see is that the first 40 levels are kind of boring. It would be nice if the developers cut that in half. I’d like to see 10 missions with 20 levels in each.